I rarely begin a post with a picture, however, I would like to pay tribute to one of the most remarkable creatures to occupy the sky. 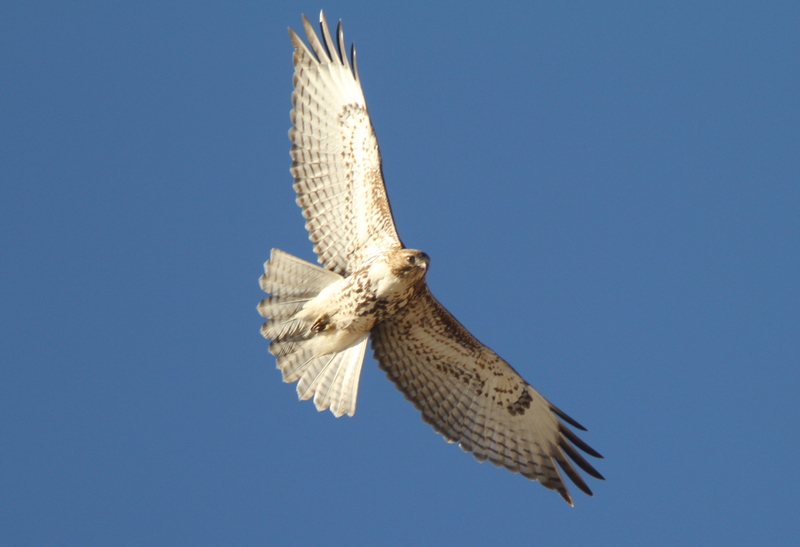 For reasons truly unexplainable, I find myself fascinated with the varieties of the Red-tailed Hawk, particularly and most intensely, the Harlan’s. The striking plumage and variable tail patterns certainly seem to be the most fascinating aspect of the Harlan’s. Perhaps it is the little known aspects of the birds great north breeding ecology, and the overlap with other Red-tailed strains creating intergrades and even more peculiar and strange forms of this relatively common species. I find the Red-tailed world intriguing on multiple levels, and I have made the goal of a lifetime study of the bird. In my search to specialize for my graduate work, I do at the moment believe I have found my candidate. I spent the other day photographing birds with Jerry Liguori once again. Of course he lent me his equipment for more photography fun. I still can’t put a finger on why he would be willing to do so, other than his kindness. So I must admit, this entire post is all due to Jerry’s kindness, and I would not have been able to get any images near the quality of what is shown without his help. Jerry has studied raptors for years. He also has a keen interest in the Red-tailed Hawk. He has written many articles on Red-tailed variants like the Harlan’s and the Krider’s, and has shared a few with me. I have gained much satisfaction in browsing through a number of Harlan’s tail shots that he sent me, illustrating the vast variety that exists among these birds. I actually blame Jerry for feeding my obsession with the bird. Now he has to put up with my endless intrigue as I pick his brain for answers regarding Harlan’s. On this outing we went to an area of particular popularity due to the high density of wintering raptors. As any Utah birder likely knows, the area I speak of is the basin directly south of the point of the mountain. The birds detailed in this post were all photographed at this basin. Keep in mind that I stayed in place for a few hours, and the amount of birds featured in this post occupy the area around the basin, which is little more than a square mile. Wintering ecology is an amazing thing, as normally territorial birds put up with others, not even of the same species, and share the resources at hand. 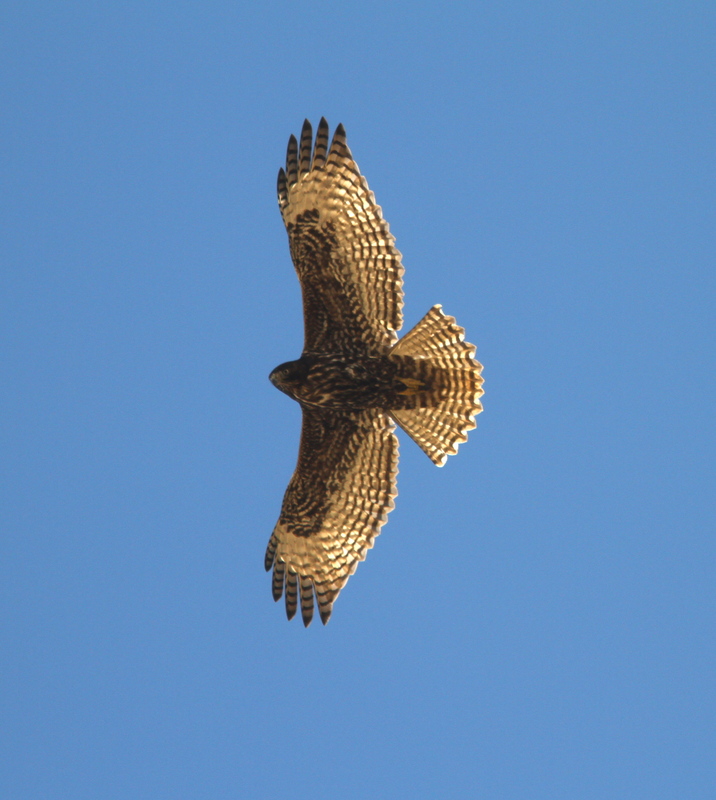 This year, multiple reports of Harlan’s Hawks at the point have hit the hotlines. 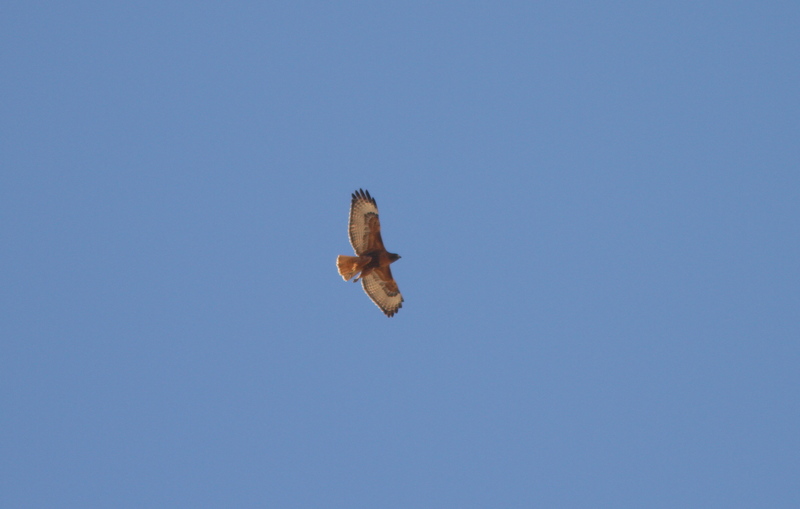 I had visited the area in November, and saw a Harlan’s, but the soaring raptor was much too high for any reasonable photography. On this day with Jerry, my luck changed. We had a Harlan’s fly in close to provide me the opportunity at my first close range photo shoot of my favorite flyer of late. This young Harlan’s is a favorite of another Utah birder. Tim Avery constantly posts his images of the point of the mountain Harlan’s. He met up with us after a while and was right alongside me when the bird came in for the shot. According to Tim, the photos he took were the best Harlan’s he has to date. I must admit, I like his shots better than mine. The young Harlan’s was actually not the most exciting bird of the day. As Jerry and I drove south on the freeway before reaching the basin, I told him of my lack in confidence for identifying a light-morph Harlan’s, and how much I would love to see one in the field. I feel that some of Jerry’s self proclaimed luck then rubbed off on me, or perhaps I was just lucky enough to be with him, but one of the first birds we saw as we came to the basin was in fact an adult light-morph Harlan’s. Regrettably our luck only went so far, and I never reached a close distance in order to photograph the bird. Jerry, with his great lens, actually caught the bird from behind as it landed on a post. The tail was perfectly spread, exposing a silver-ish base fading to a nice reddish tone. A few feathers even had some slight banding. A perfect Harlan’s tail, and a beautiful bird. There were a total of three Harlan’s at the basin that day. I photographed two, both of which were juveniles. The second bird displays perfectly an aspect of my fascination. The white breast is peculiar, and sets it apart from the other young bird we saw later. I love the variation, and I can’t get enough of studying these birds. It was delightful to watch the numerous birds interact with each other. Near the peak of the mountain five birds flew, toying with one another. As it appeared, the birds seemed to be enjoying the sun, with full crops and playful spirits. 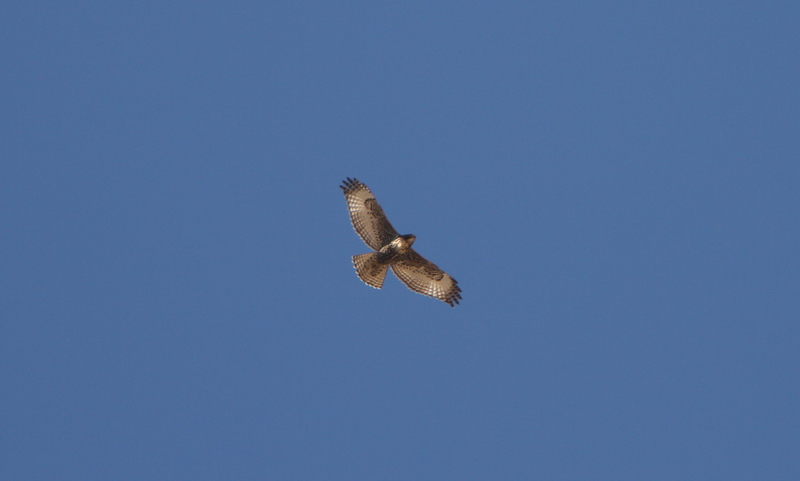 As I watched, I noticed that one of the birds was in fact a Rough-legged Hawk. The interaction did not appear aggressive, which made the sight much more peculiar. 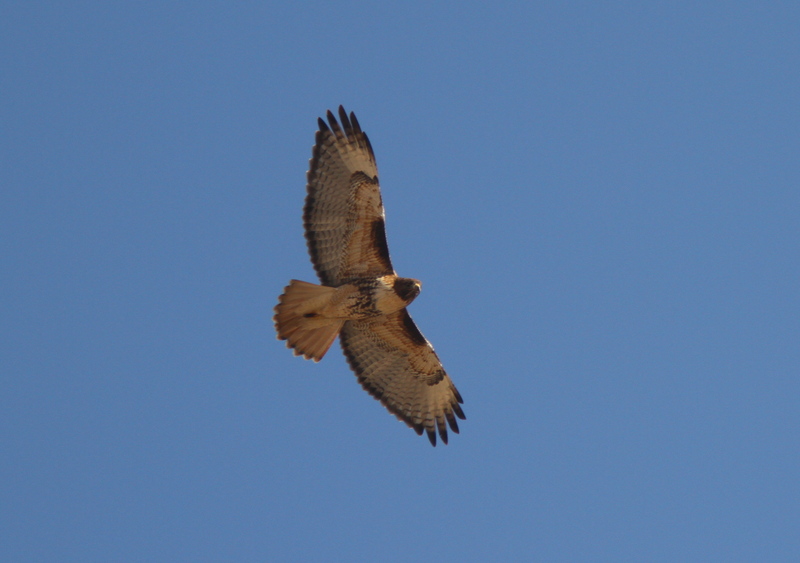 Seeing the Buteo’s fly together reminded me of a bird found last year in the mid-west. 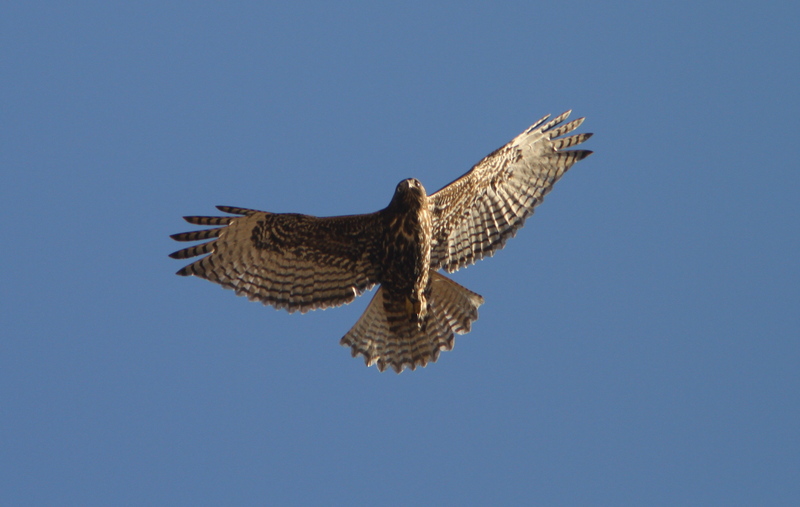 It appeared to be a hybrid between a Red-tailed Hawk and a Rough-legged. When breeding season comes, and birds have trouble finding a mate, it can happen that two birds of different species pair up in desperation to procreate. 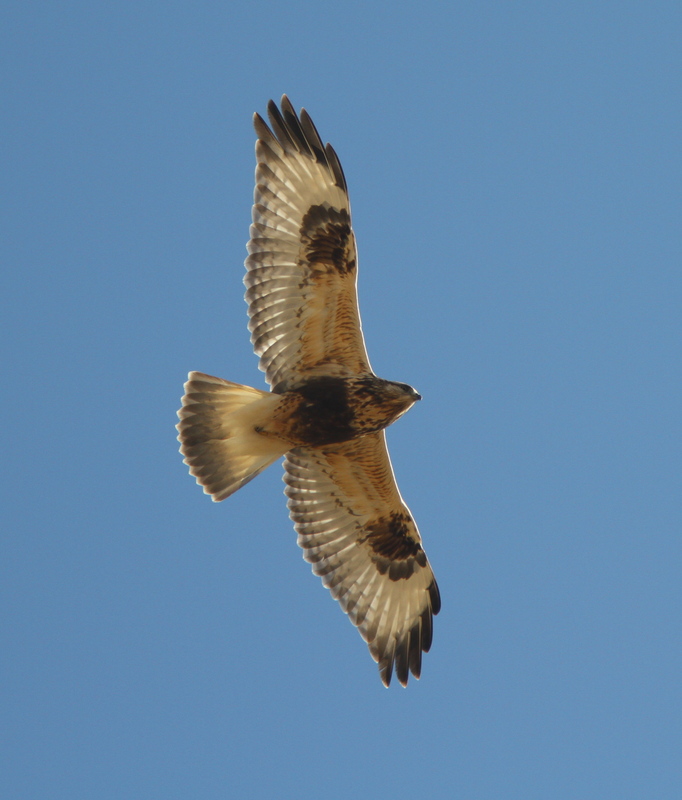 I have even heard of Ferruginous Red-tailed Hawk hybrids. 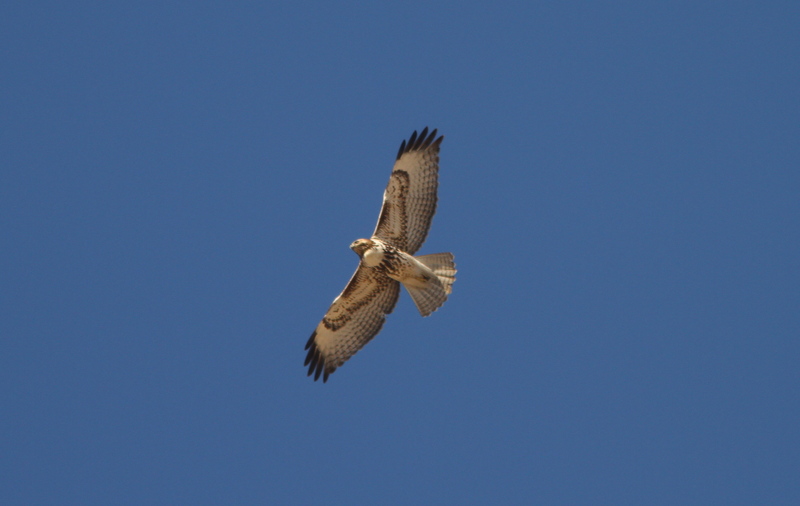 One of the reasons I am so intrigued by Buteo jamaicensis is the variable plumages that exist. 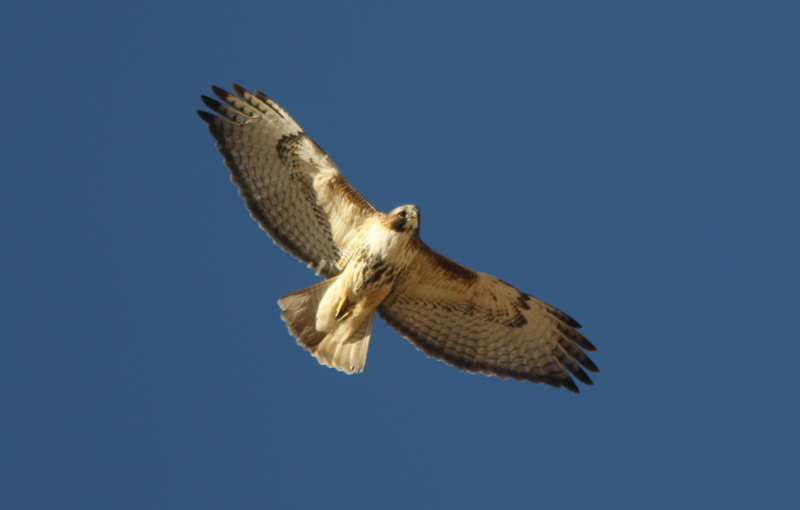 The Western Red-tailed Hawks that were present provided a great look at the variety present in even the more common strain. From juvenile to typical adult, all were there. I would have liked close up photos of all of the birds that day, but birds are only so cooperative, or better said, I am only lucky to a point. Still, I came away with great shots of a number of birds. Jerry mentioned an interesting point after seeing an adult western bird with a white throat. Apparently some years back it was common knowledge that western RT’s lacked a white throat, like the typical bird above. This fact was cited in many guide books for the hawks of America. I found this interesting because it illustrates a point that Jerry has really tried to engrain in me, or so it seems. Facts about birds depend upon research, some research more thorough than others. We as birders, or those enthralled enough to give a damn about the particulars, need to be comfortable with getting things wrong, making mistakes, information changing, and especially saying “I don’t know”, from time to time. I respect Jerry’s humility, and his concern for passing that on to me and others who share his passion. The fact is that with a bird so diverse in plumage as the Red-tailed Hawk, there is going to be some overlap and interbreeding between regional “subspecies”. What results are birds that show characteristics of one strain, but overall resemble another. I found a bird a few weeks back that was a dark morph western Red-Tailed Hawk, yet it had a heavily banded tail that faded from a cream color at its base to a nice orange at the terminal end. At first glance I was excited at the possibility of a Harlan’s, however when I reviewed my photos, I found the bird to be a nice chocolate brown with rufous highlighting. After consulting Jerry, I learned of the importance of leaving some birds a mystery. The bird could have been an intergrade of some sort, or something else more mysterious and exciting. For now I have no conclusion, but I have come to terms with that and moved along. In the future, I may find another bird that shares the same traits, and may be armed with the knowledge and resources to discover where the bird is from and why it is so peculiar. Juvenile light morph Western Red-tailed Hawk. Note the light colored eye typical of a young bird. It was nice to see a variety of Red-tailed Hawks, but what made the day even better was when the Roughies were thrown into the mix. Because I conduct winter raptor surveys, I find myself with plenty of opportunities to photograph these arctic birds, but with Jerry’s help, I believe I came a way with my best photos to date of Buteo lagopus. They are at least in a close tie with those photographed last week using the same camera and lens. 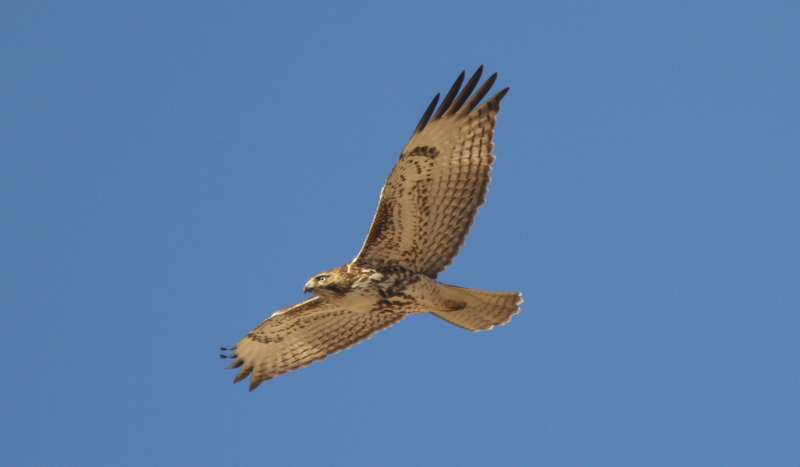 It seems that I only find Juvenile Rough-legged Hawks this year. What that fact is attributed to I can only wonder, but perhaps it is tied to wintering ecology, perhaps not. 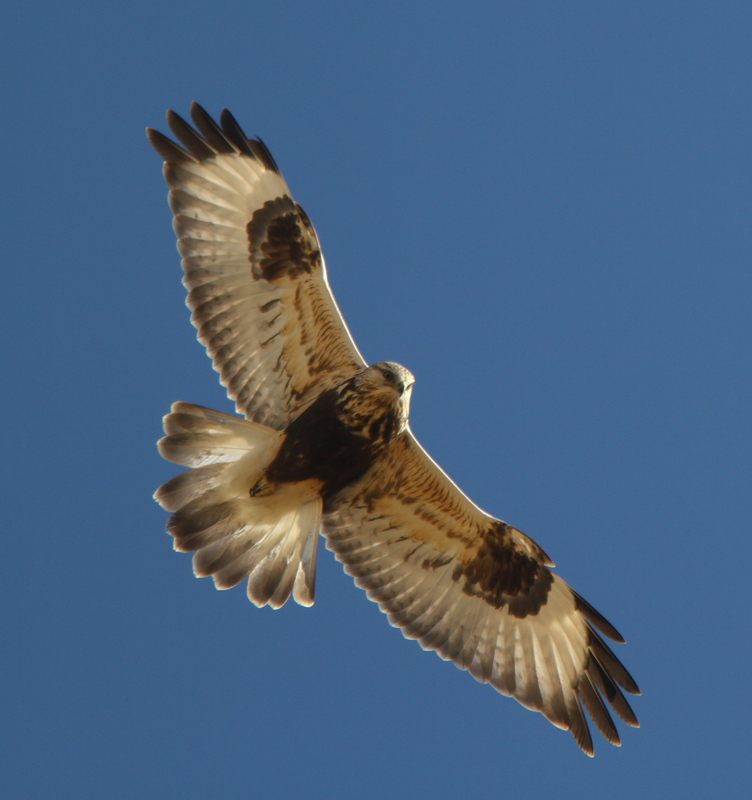 While we watched two Rough-legged Hawks soar together, Jerry and I heard the high pitch call of the birds. This was the first time the call of Buteo lagopus settled upon my ears. I did not take it for granted, and I will not forget the sound. Although the point of the mountain is frequented with large, loud, and stinking trucks, it is a special place to gain a glimpse into the wild world. It stands as an inevitability that the area will soon be crowded with humanity, and there will no longer be a place for these wintering birds. They will undoubtedly find fortress someplace else, and we birders will follow. Still, how wonderful it would be to see these birds respected, and their winter home set aside from the expanding suffocation of the human world. I see no reality in the idea, as Utah County continues to grow faster than an adolescent boy, but may the seed be planted and pondered on. If you love raptors, make a point to visit this area. If you are respectful of the birds, and the truck drivers that pass, you will certainly have the best day of raptor watching you could ever ask for. Thanks Lisa. I am glad you enjoyed the photos. It’s nice to hear from another Utah birder.